With changing and increasingly complex regulations, local businesses must view company secretaries as an investment, not a burden. Annually, the Accounting and Corporate Regulatory Authority (“ACRA”) issues approximately 10,000 summonses to companies and their directors who are in default of the statutory requirements under the Companies Act. Amongst the various reasons for non-compliance, the most common reason cited is ignorance or lack of awareness , which emphasizes the crucial role that a company secretary plays in keeping the company, directors, shareholders and auditors fully aware of statutory requirements. Therefore, retaining a well-trained and experienced company secretary is vital for all companies seeking to do business in Singapore. 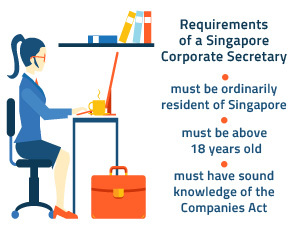 What is the main role of a Singapore Company Secretary? Company secretaries (who are also considered officers of a company) assist in the administration of a company and ensure that directors and shareholders are kept well informed of statutory obligations, such as the annual filing of audited accounts and the holding of annual general meetings (“AGM”). In Singapore, the criteria for being a company secretary for a private limited company is not stringent and this role can be undertaken by any Singapore resident (i.e. Singapore citizen, permanent resident or an individual with an employment pass) above 18 years of age. This unfortunately leads to a “gap” of knowledge as inexperienced company secretaries may lapse in keeping the company, its directors, shareholders and auditors duly informed of the statutory requirements and deadlines. Additionally, there is no minimum cap on the number of companies that an individual can be a company secretary of; hence the level of dedication and responsiveness of the company secretary may be compromised. On the other hand, there are far more requirements for being a company secretary of a public company, as the company secretary would need to be trained and qualified as a lawyer, an accountant, or be a member of the Singapore Association of the Institute of Chartered Secretaries and Administrators (“SAICSA”). While these requirements only apply to a company secretary of a public company, ACRA may require a private limited company to appoint a professionally qualified company secretary if the company is found to be persistently in default of the statutory requirements. How should I decide on who should be my company secretary? “Transparency is the lifeblood of the market. Directors need to take their statutory duties on annual reporting seriously. ACRA will spare no effort to ensure that the business information on our register is accurate and reliable, for the benefit of all market players,” Mr Kenneth Yap, Chief Executive Officer of ACRA, was quoted as saying. As an officer of the company, a company secretary will have access to; and is responsible for, the company’s registers, minutes book and electronic filings with the ACRA. It should be noted however, that ACRA considers it to be the duty of the directors of a company to take all reasonable steps to ensure that the company secretary has the requisite knowledge, experience and is capable of carrying out all duties required of a company secretary. Otherwise, directors will be held responsible by ACRA for any lapses in updating the registers and completion of the appropriate filings and returns in relation to changes within the company in a timely manner. Hence, it is generally advisable that directors opt for a professional corporate secretarial firm to perform this role and undertake to provide sound advice and ensure that all corporate actions performed by the company (i.e. such as a transfer or allotment of shares) are properly documented, filed and valid under Singapore law. 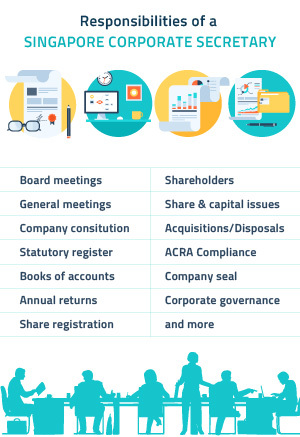 For example, for a transfer of shares, there are several steps to be taken, which include (i) passing of a directors’ resolution to approve the transfer; (ii) filing an electronic return with the ACRA; (iii) updating the company’s register of members; and (iv) issuance of a share certificate. Omission of any of these steps could arguably lead to a dispute over the ownership of a company. A good company secretary must also be proactive and undertake the role of being the main liaison to communicate important information to all parties. In the case of the AGM, which is held once every calendar year, a good company secretary will provide advance notice to the company on when it should instruct its auditors to commence the audit. Thereafter, the company secretary will prepare the necessary documents and liaise with directors and shareholders on a timely basis, to ensure that a quorum is present on the proposed date for the AGM to be convened and held. A good company secretary will also be able to advise the company when the annual returns should be filed with ACRA, (i.e. within one month of the AGM. If otherwise, penalties may be imposed by ACRA for not meeting the prescribed deadlines for the AGM and annual return, respectively). Besides the annual return with ACRA, a company is also required to file its taxes with the Inland Revenue Authority of Singapore (“IRAS”). Certain companies that meet the requirement may even apply for government grants or tax rebates. For example, IRAS has a Productivity and Innovation Credit (“PIC”) scheme which can give companies up to 400% tax deductions or allowances and/or 60% cash payout for investments in innovation and productivity improvements. A good company secretary who is regularly updated on new government benefits and schemes will likewise keep the company informed and can advise how a company can qualify under these schemes, which will result in cost savings for the company. Naturally, the ability of a company secretary to advise the client is also dependent on how well the company secretary understands the company’s business. The onus is on the company to give the company secretary a good idea of what the company’s business is. What are the duties and responsibilities of the Company Secretary? Function as an intermediary between the company and the relevant authority for specific needs of the company such as ACRA, the Stock Exchange and the Inland Revenue Authority of Singapore. A good company secretary is also always approachable and available to provide the company with advice as to what the proper procedures should be with regards to any agreements, corporate guarantees, leases and investments, or any other issues that the company may have whilst conducting its business in Singapore. What are the powers of the company secretary? Since the company secretary is generally recognised as the key person who maintains the records of the company, certification of company documents by the company secretary is generally accepted. For example, when opening a bank account, a company is required to pass a resolution by directors to approve the account opening. The bank will usually require a certified copy of this resolution for its records before it processes the opening of an account. This certified copy will typically be jointly signed by a director and the company secretary. Similarly, auditors will request company secretaries to certify the records of a company’s minutes book for their annual statutory audits. More importantly, a company secretary can also advise the company and its directors on what should be done to stay compliant when executing various corporate actions. For example, when entering into a loan agreement, the company secretary can advise the company and its directors if any terms and conditions of the loan agreement could potentially conflict with the company’s M&AA, assist to prepare the necessary documentation such as a directors’ resolutions in writing to approve the transaction, appoint a corporate representative to legally represent the company to sign all relevant documents pertaining to the loan agreement and ensure that the proper authorisation is given for the affixing of the common seal of the company in accordance to the company’s M&AA. Companies must make the right decision when retaining a company secretary. It is important that companies invest right, start right and stay on the right track with a trusted company secretary who can give sound advice on statutory requirements and how to stay compliant for all your corporate actions.